If you are looking to accelerate your game even further, check out our TRAVEL TEAM options with desert heat. Prior desert stiX experience is encouraged. When and where is desert stiX? We offer three seasons throughout the year at various locations and then have recently added on a summer stickwork program. Locations change based on the seasons so please refer to the individual "team" tab for information. Click on "TEAM" tab above, then make sure you are in the correct year, click the age group you are interested, and then fall, winter, or spring session. This is where we will keep the most up-to-date info on each program. What does a desert stiX season include? Each session entails drills, stations, scrimmages, and fun learning games. The purpose of desert stiX is to prepare girls with the fundamental skills they need to advance in the sport of lacrosse. Girls are frequently divided by skill levels to help them grow and advance as time progresses. Check out our rules and terms page for more information on specifics for play. When does desert stiX meet? Once a week during each session. Please refer to the individual "team" tab above for your daughter's updated practice schedule. desert heat Additional practices + travel tournament opportunities in the Fall, Spring, and Summer. Please refer to the desert heat page for more information. To register for desert stiX, please go to our online registration page. 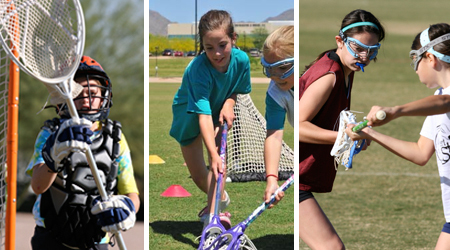 "Desert stiX is a great way for girls to learn the skill and teamwork involved in playing lacrosse, as well as the basic rules and different playing positions. Our daughter has been getting pointers from her coach and developing her skills at practices, with lots of opportunities to play against other girls that are learning the sport, too. It has been exciting to watch her learn lacrosse and she is having a lot of fun! It's a great way to make new friends with girls from all over the Valley. We appreciate all that you've done to bring this sport to our community!" "Desert stiX has been an amazing experience for my daughter. She was brand new to the game and with all the excellent coaches and positive support, lacrosse quickly became her favorite sport after years of playing soccer. She has been able to grow her skills rapidly with the extra experience of being on the Desert Heat travel team. She has really enjoyed traveling to California several times for tournaments and made many great friends. Thanks to all the coaches for their tremendous support for her as a player and her personal growth!"